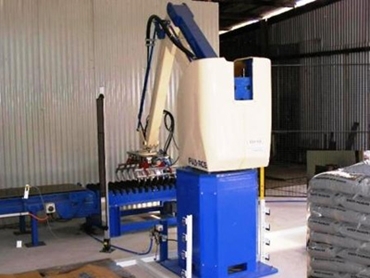 An Accuweigh automatic bag palletiser is being used to stack bags for a supplier of organic fertilisers in Western Australia. Supplied by Accuweigh/Budpak’s Perth branch, the bag palletiser has helped the fertiliser supplier overcome ongoing labour shortages, which were hindering company expansion. The Fuji-Ace EC-101 robotic bag palletiser replaced up to two workers engaged in manually moving and stacking heavy bags, which was fast becoming a potential OH&S issue for the company. The bag palletiser now automatically stacks the 20kg and 35kg poly bags of organic fertiliser onto pallets. A properly configured bag palletising system significantly improves the presentation of loaded pallets through increased bag placement accuracy, which also improves overall pallet stability during storage and transportation. The EC-101 bag palletiser from Fuji-Ace is highly efficient and provides an extremely inexpensive solution for meeting low to medium palletising requirements. Fuji-Ace’s new generation of robot palletisers provides ultra-quiet operation, improved energy efficiency and maximum flexibility. The leading industrial weighing and packaging company in Australia, Accuweigh/Budpak operates branches in all mainland states providing superior product support on bagging equipment, bag palletisers and stretch wrappers.